Star Trek fans and film audiences know that Sulu -- the Enterprise helmsman from The Original Series memorably portrayed by George Takei, went on to captain his own ship, the USS Excelsior. But the harrowing circumstances that led to his first command have never been revealed ...until now. 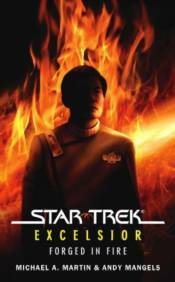 Forged in Fire provides a long-missing link in Star Trek history, bridging past and future with an account of turmoil within the Klingon Empire which threatens to spill over into the Federation -- and of the personal vendettas that stretch from one generation to the next. A vicious pirate known as The Albino is cutting a deadly swath across space, driven by need and motivated by malice. But his genocidal plans have unimagined consequences, as the human boy he orphaned long ago joins forces with several unlikely allies -- three Klingon captains and a hotheaded Federation diplomat who carries a closely guarded secret -- to bring The Albino to justice. Tempered in the flames of shared adversity, a captaincy is won, a Blood Oath sworn, and the fate of a civilization is decided.